Retail outlets and shopping malls are renowned for energy overconsumption. At malls in Italy, it’s not uncommon for air-conditioning to be left running 24/7: a practice that is neither sustainable nor cost-effective. The CommONEnergy project was initiated to re-conceptualise shopping malls by creating new energy efficient structures that promote energy conservation and utilise renewable energy resources. Nilar was chosen as the ideal partner to provide an effective energy storage solution for Italy’s first smart shopping mall – the Grosseto. 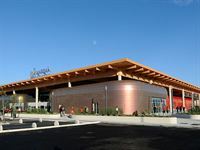 A new initiative is underway in Italy to improve the sustainable footprint of shopping centres. The first, in what should be a long line of Italian malls to become greener shopping environments, is The Grosseto in Genova. The initiative includes the development of a renewable energy solution and a scalable electrical vehicle charging station that can cater for 10 cars today, but potentially hundreds in the future. Charging of electric vehicles requires a great deal of power, especially when several vehicles are being charged simultaneously. In order to minimise stress on the main power grid at The Grosseto, the plan is to use renewable energy to charge the vehicles. As always with such applications, safety is a major concern for the mall as tens of thousands of people pass through the building during the course of a day. A solar panel system with a total power capacity of 350 kWp has been fitted to the roof of the shopping centre. Out of the 350 kWp, 70 kWp are dedicated to supply power to a Nilar 48 kWh energy storage solution, where the energy is stored and/or used to charge vehicles in the parking lot. The entire process is managed by Nilar’s BMS (Battery Management System). The Grosseto has taken an important step towards optimising the use of solar energy. Thanks to Nilar’s NIMH-based battery storage solution, solar energy is stored efficiently and safely at the mall, and impact on the grid during electric vehicle charging is minimized. The benefits of Nilar’s technology go far beyond the ability to charge electric vehicles efficiently. The Grosseto expect a 75% reduction in overall energy demand, a reduction of power peaks, and a 50% increased share of renewable energy resources – all paving the way for a sustainable and greener shopping mall with reduced energy costs. Nilar is the leading provider of battery energy storage solution for today’s infrastructure. The unique bi-polar construction of the battery pack provides reliable storage and a stable power supply from a lighter, safer and greener unit. Furthermore, the modular design allows packs to be coupled in parallel and series to deliver the power and capacity required to meet the needs of smart grid, telecom base stations, home solutions and other applications. Since it was founded by leading experts from the battery industry, Nilar has always sought to challenge the norms of the industry. From its two R&D departments in the USA and Sweden, the company has revolutionized energy storage and power supply technology. Today, manufacturing is handled at the company’s state-of-the-art factory in Sweden.